The seamless integration between Elation's EMR and Kareo gives you an affordable and easy to use medical office software platform designed for Chronic Diseases. Staff create new patient records and manage schedules within Kareo. Everything automatically flows into Elation for the clinician. Simultaneously order medications, tests, reference reports and notes, all while documenting your visit. Elation's intuitive patient chart layout helps the clinician stay organized and find information quickly during patient visits. Elation's built-in communication tools make it easy to share patient information with care collaborators. Elation also enables easy and secure online messaging with any provider. 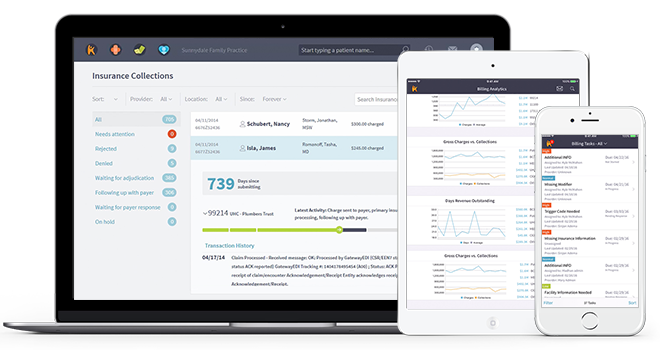 Elation helps you code your patient visits by remembering ICD-9 codes and letting you maintain a custom list of CPT codes. As you finalize patient visits in Elation, charges are automatically sent to Kareo and claims are generated. After you review and approve your claims, submit them electronically to your insurance providers. Our intuitive chart layout helps you stay organized and find information quickly. Keep the notes from the previous visit in full view during your present visit. Quickly scroll through the straightforward Chronological Record, or skip to any part.